Lindblad Expeditions, the U.S.-based small ship expedition company which partners with the National Geographic Society for expedition cruising, has announced that Orion Expedition Cruises will become part of Lindblad's existing fleet starting with March 2014 itineraries, offering Orion past and future guests access to expeditions around the globe. "We are extremely excited about the opportunity to offer global expedition cruising to Australians and we intend to bring the full weight of our experience and that of National Geographic to the Orion organization and the ship", said Sven Lindblad, President and Founder of Lindblad Expeditions. Lindblad Expeditions owns five ships: the National Geographic Explorer, the National Geographic Endeavour, the National Geographic Sea Bird, the National Geographic Sea Lion and the National Geographic Islander. In addition, Lindblad charters five ships – the Delfin II, the Lord of the Glens, the Oceanic Discoverer, theJahan, and the Sea Cloud for seasonal expeditions. travel and work on my golf handicap." Destinations include Arctic Svalbard, Antarctica, Alaska, Baja California, Central America, Galapagos, the Amazon, New Zealand, Africa, British Isles, Egypt, Europe, the Mediterranean, the Pacific Northwest and South America. Trey Byus, Lindblad's Chief Expedition Officer, said "The geographies that Orion has explored in the past are well known to us through the decades, but I was very much impressed with the knowledge of the Orion team. It has been a joy working with them to develop compelling ideas for the future." Sarina Bratton, the founder of Orion, will leave the business on completion of her current contract on April 19. "The move is both amicable and timely," she said. "I will welcome a break in which to travel and work on my golf handicap." 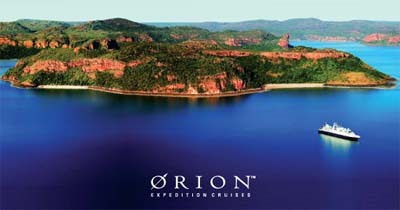 Orion Expedition Cruises pioneered and defined five-star small ship expedition cruising in the Australasian market. It has taken thousands of people to The Kimberley, Antarctica, Papua New Guinea, Borneo and explored the far reaches of the Russian Far East, Japan and SE Asia introducing guests to five-star adventure and creating unsurpassed travel memories. In addition to the awards won by the company, Sarina herself was named Veuve Clicquot Business Woman of the Year, Ernst & Young's Entrepreneur of the Year (Services) and Travel Innovator of the Year. "Sarina has created something quite wonderful in her 9 years at the helm of Orion Expedition Cruises" says Sven Lindblad. "We respect both her and her team immensely for what they have accomplished. It is our job now to ensure that the Orion travelers continue to receive remarkable travel experiences, both on Orion and our other ships. After all, it is their full faith and confidence that is the essence of this enterprise." 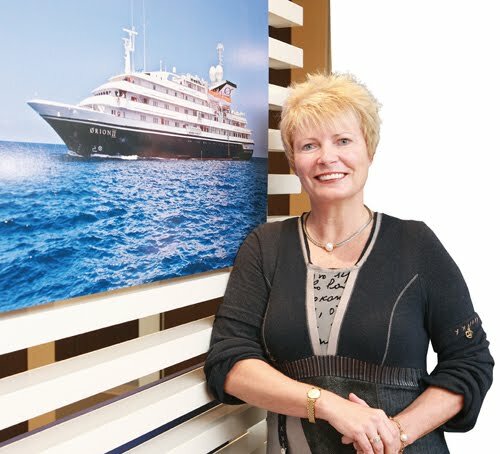 Legendary ocean explorer, Valerie Taylor, a long-time collaborator and friend of Sven Lindblad and his pioneer father, Lars-Eric, said: "When Sven and members of his team came to visit me and friends in Sydney in January, we went way into the night telling stories that dated back to the 70's. My husband, Ron, and I went on numerous expeditions (at least 30) with both Lars-Eric and Sven and collaborated with them on building a better understanding of the ocean's wonder and importance. When Sven asked me if they would be interpreted as "interlopers" coming into Australia, I had to laugh. Of course not, I said, you will be welcomed with open arms." Orion is owned by Cruise Ferry Master Fund, which represents the investment division of German bank DVB in partnership with a German private equity group. The Cruise Ferry Master Fund also owns 60% of Lindblad. Updated: Fire aboard True North. All safe.